The Park is currently hosting its annual Santa Safari event and animal keepers have been thinking of some inventive, festive ways to get the animals in their care involved in the Christmas spirit too. 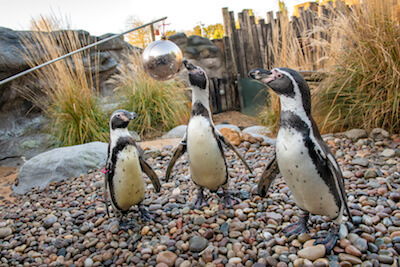 Firstly, the ‘waddle’ of 19 Humboldt penguins were introduced to a large, shiny gold bauble, which the keepers have been using like a target stick – every time the penguins tap the bauble with their beak, they get a fishy treat. Although some of the penguins seem to enjoy just chasing the rays of light that reflect off the shiny surface, whilst others simply like musing at their distorted reflections! Meanwhile, the rainbow lorikeets have been treated to a Christmas tree made by their keeper, Laura Hodgkins. She explained, “During the weeks before Santa Safari, we’re closed to the public, which is the perfect time for us to come up with enrichment ideas. Usually the guests can feed our lorikeets with a pot of nectar, but with the absence of this, the birds have a lot of time to do their own thing. Most of this involves preparing for the arrival of babies; from building their nests, to the act of mating and then incubating their eggs. Both the lorikeets and penguins can be found in the Park’s walk-through Discovery Trail, which is currently transformed into a winter wonderland, with Christmas trees, snow, lights and festive decorations. It’s also where guests can find Santa and his elves in the magical grotto. Santa Safari is running daily until Christmas Eve and also on 29 and 30 December. Some days, including Christmas Eve are already sold out, so booking in advance is advised. Admission is £24.00 for adults, £20.00 for children aged 3-15 years, £8.00 for children under the age of three and £21.00 for concessions. Admission includes a free return ticket. Group and school discounts are also available and annual pass holders or visitors using their return voucher can upgrade to Santa Safari by booking ahead. The Adventure Theme Park is closed during the winter season.